Our life is not an invention. It is a gift from God. He had the courage to trust in us so much that he placed the gift of life, the gift of existence, into our hands life, existence, and gave us the necessary tools to live it well. Perhaps we never considered life as God’s initiative. Often times we think that we are born because our parents wanted us or by chance, or for other human and natural reasons. We must believe that life does not come by chance. It is not ours; it is a gift from God, born from his heart, which is Love; it is a gift that we must begin to unwrap, just like when we are given a beautifully wrapped gift. With curiosity we tear open the package to find out what is on the inside and why it was given to us, a reason that undoubtedly will give us great joy…. We all love life for what we see, feel, and touch, but life does not belong to us; it belongs to Someone else, we belong to someone who wants to take care of us and who wants us to discover the true flavor of life, for he knows that only in this way will we be truly happy.. 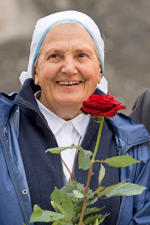 Mother Elvira Petrozzi is foundress of Comunità Cenacolo, welcoming the lost and desperate in forty fraternities in thirteen countries.